I enjoy cooking, and I have several dog-eared cookbooks and food-stained index cards featuring the recipes for many of my family’s favorite dishes. I also enjoy trying out recipes I find in magazines, newspapers, or online. Recipes are an indispensable tool for cooks, helping us perform the “kitchen chemistry” that transforms ingredients into delicious, “table-ready” meals. But implicit in most recipes is the notion that cooks know how to handle raw products, including produce, poultry, fish, and meat, safely. Based on data on foodborne illness outbreaks from the U.S. Centers for Disease Control and Prevention (CDC), some of us may not actually be that savvy about food safety. CDC reports that in 2016, there were 76 reported foodborne illness outbreaks from foods cooked in U.S. homes. This represents approximately 10% of all reported foodborne outbreaks for that year. So, while cooks can get the kitchen chemistry right by following recipes carefully, we could be coming up short in taking the steps needed to help ensure our foods are free of pathogens, such as Salmonella, E. coli, and Listeria bacteria. One tablespoon of regular, unscented bleach in one gallon of water makes a very effective surface sanitizer for food-contact surfaces. Clean surface of food debris first, using soapy water, then apply the bleach solution and let air dry. 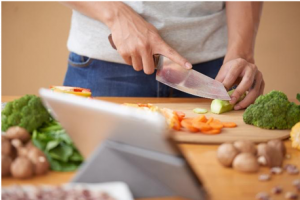 A few years ago, food scientists from Kansas State and Tennessee State Universities set out to determine whether the addition of food safety reminders in recipes could lead to improved food safety behaviors in home kitchens. The researchers designed a comparison study of two groups of volunteers in which randomly assigned individuals in each group were invited to prepare two dishes in test kitchens according to recipes provided. Ingredients required and supplied included raw chicken breast, ground raw turkey, and a raw egg. Each of the 155 participants was given ingredients, cooking tools, and time to orient themselves in the test kitchens. The only difference between the two groups was that individuals in the “test group,” comprising 73 people, were given recipes that included food safety instructions to emphasize hand washing and thermometer use (with basic instructions on how to use a thermometer). The 82 members of the “control group” were given the same recipes, but formatted in a typical recipe style in which there are no food safety instructions. All participants were observed as they prepared one food item at a time. Food safety behaviors, such as hand washing and thermometer use, were observed and recorded by “helpers” who were described to participants as being present to provide assistance, if needed, in finding items in the kitchen. Participants who were given recipes containing food safety instructions demonstrated better food safety behaviors overall than participants whose recipes lacked food safety instructions. The proportion of participants who washed their hands before cooking and after handling raw poultry products was significantly higher among those who had been provided recipes with food safety instructions. Participants given recipes including food safety instructions were significantly more likely to use a thermometer to check cooking temperatures. Moreover, those participants provided recipes with food safety instructions more accurately inserted thermometers into foods to check cooking temperatures. There was no significant difference between the two groups in the degree to which they said they liked the recipes they were given. Given evidence that embedding food safety messages in recipes helps promote safe food practices, the Partnership for Consumer Food Safety Education recently released a Safe Recipe Style Guide that “provides easy edits to any recipe to improve food safety practices.” In a March 7 press release, the group explained, “The Safe Recipe Style Guide is designed for use by any recipe writer – professional recipe developers and food journalists – who writes and publicizes recipes for distribution to the public. 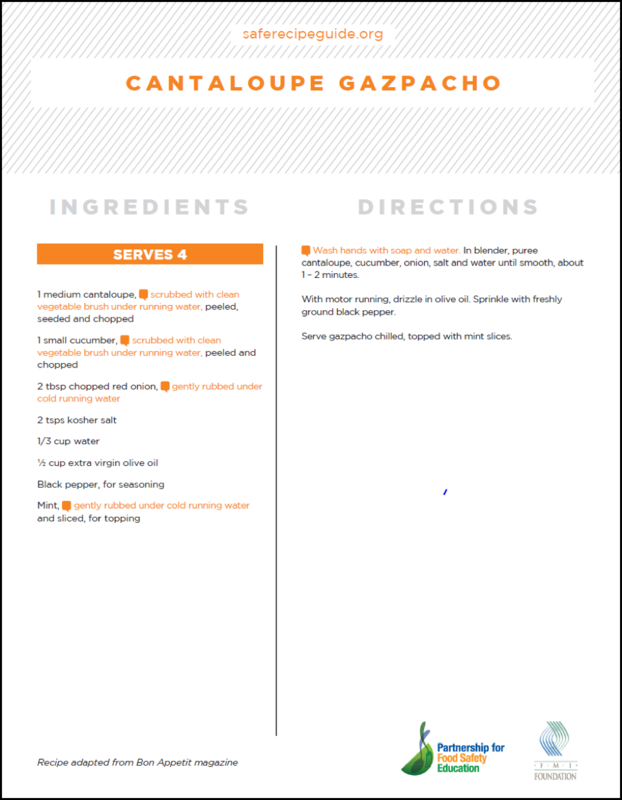 It provides specific, concise recipe text to address the four major areas of most food safety violations in home kitchens: temperature, handwashing, cross contamination and produce handling.” A sample recipe from the Partnership website for “Cantaloupe Gazpacho” appears in the text box below. Food safety directions are color coded to be distinct from traditional recipe preparation steps. We applaud the Partnership for its significant contribution to promoting food safety through recipes, and we encourage recipe writers, especially those who are passing down family recipes to the next generation of cooks, to use the Safe Recipe Style Guide to encourage safe food practices.